The Environment Secretariat (SMA) of São Paulo (SP) today published for public comment on its website a draft bill for a law on post-consumer packaging. The bill would create a rather complex shared responsibility system to ensure that post-consumer packaging in SP is either recycled or reused. Anyone wishing to submit comments or suggested changes to the bill’s language can do so until 22 June in an email addressed to planejamentoambiental@sp.gov.br with the subject line “PL Pós-consumo”. I’m a bit surprised by this initiative. Not so much by the SP Administration’s interest in taking action on packaging waste, or the fact that they are choosing a new law instead of a implementing decree for the State Solid Waste Policy Law — I’ve known for awhile that they wanted to tackle the issue, and that internal debate had decided that an implementing decree focused on a single waste stream might not withstand a legal challenge. No, I was surprised (a) that they had the guts to draft a packaging law; (b) by the mechanism they chose to promote packaging recycling/reuse. 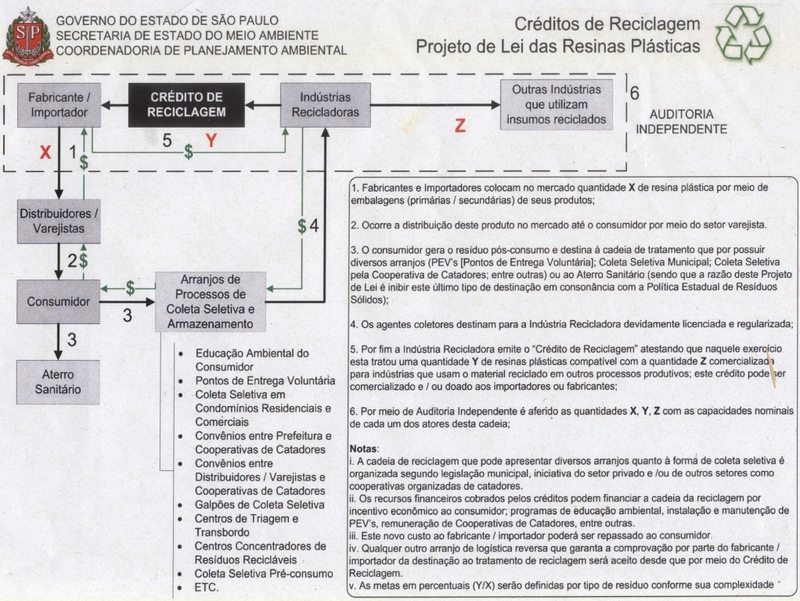 Regarding the former, SP is the home to much of Brazil’s packaging manufacture, transformation and filling industries, and to the packaging industry association, ABRE, most of the packaging material trade associations (ABAL, ABEAÇO, Abipet, Abiplast, Abividro, ABTCP), and their ally, FIESP, Brazil’s most powerful industry federation. 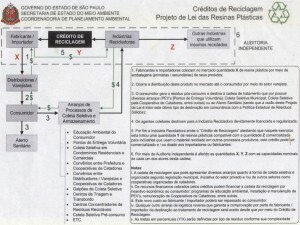 As for the mechanism, I find it interesting that they have chosen a complex “recycling credits” system (click on the graphic above to see larger version of the diagram of this system) instead of a more traditional deposit-return, producer responsiility, recycling mandate or take-back model. What exactly is the system proposed under the draft bill? Well, the bill would require post-consumer packaging to be given “environmentally adequate treatment.” “Post-consumer packaging” would be defined as any packaging used to protect food, beverage and cosmetic products, as well as unspecified “other products” [Temas Observation: Would this perhaps include the packaging used for items such as consumer electronics, small appliances, personal computers, etc.?] “Environmentally adequate treatment” would be narrowly defined to include only recycling or reuse (such as refillable beverage containers). According to the bill, the government would set recycling/reuse targets for packaging after consulting with industry. According to my sources, the intent here is to have targets for different types of packaging (glass, aluminum, steel, paper/board, plastic, etc. ), and authorities would probably set initial targets close to existing recycling levels for each, and then gradually raise them over several years. To meet the targets, producers and importers of packaged products would have to earn “recycling credits” issued by recyclers based on volumes of the packaging actually recycled or reused. Distributors and vendors in SP state with 100 or more employees (for example, large hypermarket chains such as Carrefour or Wal-Mart) would be required to take back used packaging from consumers. The manufacturers, importers and recycling firms would have to provide data on the flow of packaging and packaging waste handled and recycling credits issued and received, which would be subject to independent audit.